Target Audience: Caltrans, contractors, and local agency construction field staff using or going to be using the Caltrans 2010 Standards. 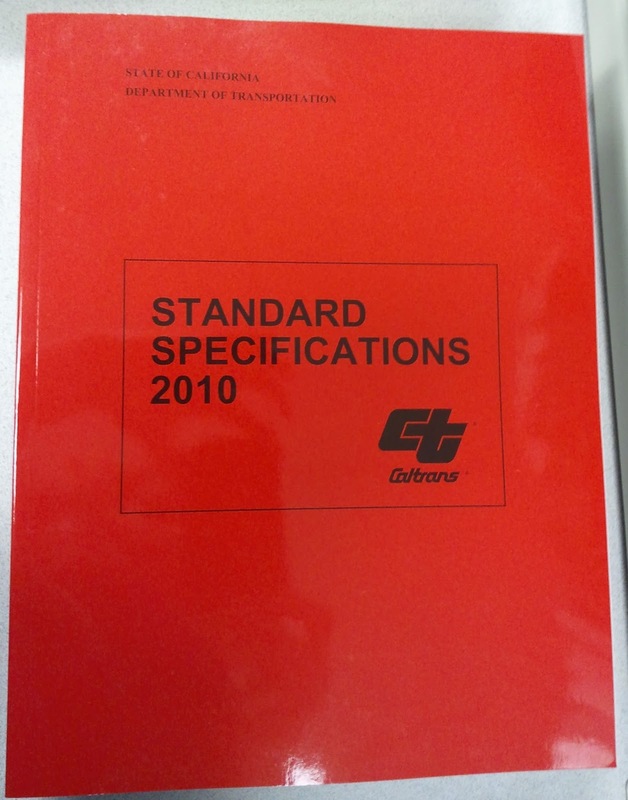 Many contractors and resident engineers are now starting to work on contracts under the Caltrans 2010 Standards and have discovered that the specifications are not in the format they are used to. I've noticed that it sometimes gives a busy error when you go to the website so be patient and refresh a couple of times. There are likely many people trying to register right now. On April 2 I gave a presentation on AMRL Accreditation at the CalAPA Bay Area Technical Committee Meeting in San Leandro. Special thanks to everyone that attended and participated in the discussion! If you are curious about the CalAPA Technical Advisory Committee Meetings, they are free meetings held at various locations throughout the state on a regular basis (usually once every 2 months) where people from all parts of the industry as well as government agencies can get together and share technical information and network. In my personal opinion this is one of the greatest features that CalAPA offers as it gives you an opportunity to learn about what's new in asphalt pavement as well as discuss any statewide issues that are occurring. I'd highly recommend attending a couple meetings to see what they can do for you and your business. You can learn more about these meetings from contacting CalAPA. Their website is http://www.calapa.net. In the meantime check out their technical committee page here where you can view various presentations and other information shared at some of these meetings. April's RSP samples will be shipped this week. They will include a sample for CT 202-Coarse Aggregates. If you do not receive your sample by the end of the week you should contact Caltrans at caltrans_reference_sample_program@dot.ca.gov. You are now allowed to use up to 25% RAP by total weight of aggregate in your dense hot mixes (as opposed to 15% in the past) RAP is still not allowed in Open Grade or Rubber mixes. Additional sampling requirements which require 1 sample of each RAP product to be sampled every 1000 tons of crushing, a minimum of 6 per stockpile. If the RAP is augmented, the spec requires that you increase this to 1 sample of each RAP product to be sampled every 500 tons of crushing. You must sample and test the RAP gradation when you are producing hot mix twice per day as opposed to once per day with less than 15% RAP. You may only adjust your RAP feeder settings by ± 3% as opposed to 5% if you have less than 15% RAP. The specification now not only designates the allowed substitution rate by weight of aggs, but also regulates the maximum binder replacement. This value is different for surface courses (25% of OBC) versus leveling courses (40% of OBC). If you replace more than 25% of the optimum binder content in your mix with RAP you will now be required to use a softer binder with the PG grade upper and lower temperature classifications reduced 6°C from the specified binder. For example if the specifications specify PG 64-16 you will now be required to use a PG 58-22. You are also allowed to request this change if you add any RAP at all in your mix. VMA, VFA, and DP are now report only. In QC/QA jobs you are now only required to test your mix for CT 371 every 10,000 tons instead of 5,000 tons. These results are still report only unless you have greater than 15% RAP in your mix. 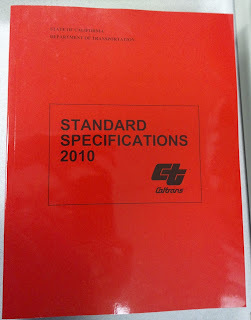 As you may know, you can view red lined copies (including the RSS changes mentioned in this post) of the 2010 Standard Specification's Section 39 on our website at the tab above labeled "Caltrans Section 39 Updates". I highly recommend you read over the 2/22/13 RSS changes since there are so many large ones this time. If you're like me you have probably been confused about what "Maximum Aggregate Size" and "Nominal Maximum Aggregate Size" mean at least once or twice in your career. The main reason for this is is that there are several different definitions. By the CT 382 definition, the maximum aggregate size is 3/4" and the nominal maximum aggregate size is 1/2". In the November 2011 version of CT 202, nominal maximum aggregate size is defined as "one sieve size larger than the first size to retain more than 10%." By this definition the nominal maximum aggregate size for the material example above is also 1/2". However, if there were only 91% passing the 3/8" the nominal maximum aggregate size for that material would be 3/8", not 1/2". Neither of these are the same definition as outlined in the Asphalt Institute's MS-2 guide for Mix Design Methods. In the MS-2 definition the maximum particle size is defined as "two sizes larger than the first sieve to retain more than 10% of the material". Although this definition uses the word "particle" instead of the word "aggregate" it can still be easily confused. In the gradation example above, the nominal maximum particle size is 3/4" because the 3/8" is the first sieve to retain more than 10% of the material (11%) under the MS-2 definition. 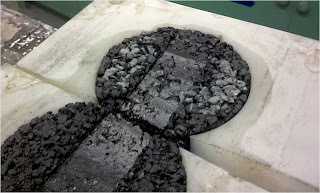 In yet another definition, the Asphalt Institute's SP-2 guide for Superpave Mix Design defines maximum size as "one sieve size larger than the nominal maximum size". The nominal maximum size is defined as "one sieve size larger than the first sieve to retain more than 10%". By these definitions the material example above would have a maximum size of 3/4" and a nominal maximum size of 1/2". So why does this matter? What are these definitions even used for? For the most part, in HMA, its just semantics and the definition will not affect your test results, just give you a whole lot of confusion in talking about it with other people. For instance, nominal maximum aggregate size is usually a way to define the size of a mix when you're referring to it. So when you're saying 1/2" HMA people generally know what that means. Where you might see a problem is in drawing the maximum density line to help with designing a mix's gradation. The maximum density gradation line represents the tightest arrangement that the mix's particles can fit together. According to the Asphalt Institute's MS-2 this line is created by drawing a straight line from the origin to the desired maximum particle size which is defined for you. However, if you use the wrong definition you could be setting yourself up for some major confusion and maybe even some unnecessary mix designs. When designing your mix you will use the maximum density gradation line as a guide for increasing or decreasing VMA. Moving the mix gradation away from the maximum density gradation line will increase your VMA and can reduce flushing. However, if you're using the wrong maximum density line you may very well be making things worse. What stories do you have where the definition of maximum aggregate size and/or nominal maximum aggregate size has made a difference on the quality of your mix? As of the January 9, 2013 update, Caltrans has pre-approved 9 warm mix technologies for the contractor option specification. The contractor option specification for Warm Mix Asphalt allows the contractor to use warm mix as opposed to hot mix with no additional charge to Caltrans. As a contractor you can use any of the technologies on the approved technologies with little to no additional work on your part. You may also be able to use a technology not already pre-approved as long as you follow the approval process for new warm mix technologies found here. The list of pre-approved technologies can be found here and has the following technologies as of 1/9/13. Cecabase RT by Arkema, Inc.
Astec Double Barrel Green by Astec Inc.
You can find more information on each of the technologies by clicking on its name above. Good luck!